EPT founder John Duthie said, "What a rush!" Several media reps declared, "What a comeback!" Just a couple of hours ago, it appeared that Michael Martin was dead in the water. He was on the brink of elimination and then he mounted his impressive comeback. He ran his stack up from 100,000 to almost 1.5 million inside of ten minutes. Then he busted fellow American Eric Liu to take over the chip lead. Although he lost the lead briefly during heads-up play, Martin remained composed and he rallied to victory. He was propelled by his railbirds, who flew in this morning to sweat him. 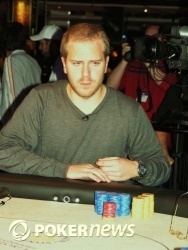 That contingency included his mother, his girlfriend, and his buddy... former EPT champion Brandon Schaefer. He did not disappoint them and made their last minute trips well worth the trouble. When EPT hostess Kara Scott asked Martin what he was going to do with his £1,000,000 windfall he remarked, "I guess it's time for me to open a European bank account." 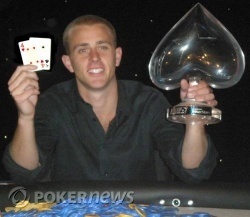 Congrats to Michael Martin...truly one of the good guys in poker. Michael Martin moved all in from the small blind. Michael Tureniec called. The flop was . The turn was the . Tureniec's last hope was any five for a chopped pot. The river was the and Martin won the pot. Michael Tureniec was eliminated in second place. The Swede won £525,314. He won a last chance satellite on PokerStars.com for a total investment of $800 USD. Not a bad investment. Michael Martin is our new 2008 PokerStars.com EPT London champion! The American collected £1,000,000. Michael Martin raised to 250,000 on the button and Michael Tureniec called. The flop came down and both players checked. The turn was the . Tureniec led out for 380,000 and Martin called. The fell on the river and Tureniec fired out another 680,000. After a bit of a think, Martin made the call. Tureniec showed for only queen high. Martin turned up for two pair, jacks and tens, and took it down. After the hand, Martin was up to 4,630,000 while Tureniec fell to 1,375,000. 1. Michael Martin called on the button and Michael Tureniec checked. Both players checked the flop. The turn was the . Tureniec bet 130,000 and Martin folded. 2. Tureniec raised to 270,000 on the button and Martin folded. 3. Martin limped from the small blind and Tureniec checked his option. The flop was . Tureniec checked, Martin bet 140,000 and Tureniec folded. 4. Tureniec gave Martin a walk, the first possibly ever from a Scandi player. We have a new chip leader...Michael Tureniec has pulled ahead by a slim margin. I'm dubbing him the Swedish Grinder. Or how about Sven Knish?